The first and largest section of the manuscript has sermons on Jesus' words in the Gospel of Matthew, arranged according to their occurrence in the gospel. This page has the end of a sermon and the beginning of Sermon 23, on the parable of the ten virgins (Matthew 25:1-13). 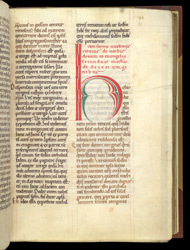 It is announced by the title, written in red in the second column, with the large coloured letter marking the beginning of the sermon. Most medieval manuscripts aid the reader visually by their graphic design, even if they could not be globally searched for the desired text.